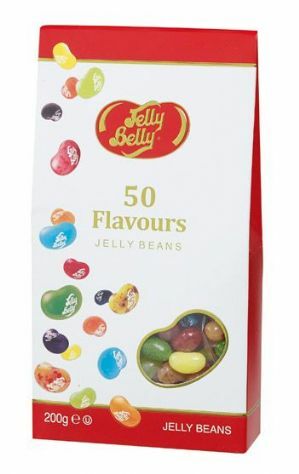 A mixture of 50 Gourmet Jelly Belly flavours. 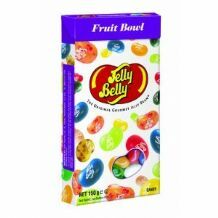 Jelly Belly 50 Assorted Flavours 200g Bag. A mixture of 50 Gourmet Jelly Belly flavours in a taper gift box. If you are not sure which is your favourite, this bag will help you decide! For the Jelly Belly aficionado - no other gourmet beans will do. including very cherry, liquorice, grape, bubblegum, red appleberry blue, cherry cola to name a few. ingredients: sugar, glucose syrup, modified corn starch, natural and artificial flavours, acidity regulators: E270, E296, E297, E325, E330, E331; grape juice concentrate, strawberry puree, peach puree concentrate, raspberry puree, blackberry puree, colours: E100, E102, E110, E129, E132, E133, E150d, E171; apple juice concentrate, strawberry juice concentrate, banana puree, lemon puree, plum juice concentrate, glazing agents: E901, E903, E904; blueberry puree, coconut, pear juice concentrate, chocolate: sugar, chocolate liquor, cocoa butter, soy lecithin, vanillin; kiwi juice concentrate, mango puree, cocoa powder, orange puree, passionfruit juice concentrate, freeze-dried coffee, tangerine juice concentrate, watermelon juice concentrate, mango juice concentrate, grapefruit juice concentrate, pineapple juice concentrate, cherry juice concentrate, ascorbic acid, cantaloupr juice concentrate, lime juice concentrate, pomegranate juice concentrate, salt, vanilla beans, tapioca dextrin, caffeine. suitable for vegetarians. kosher. gluten free, fat free, geltine free. manufactured in a factory that processes nuts.